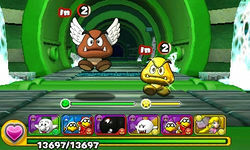 World 8-3 is the fourth course of World 8 in Puzzle & Dragons: Super Mario Bros. Edition. 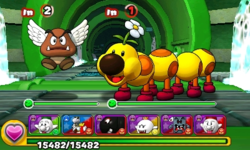 It is a basic, underground sewer level with enemies consisting of Paragoombas, Wigglers and Coin Coffers. This course is unlocked by taking the secret exit in World 8- . This level is straightforward, starting with a battle, a ? Block, a battle with two Coin Coffers of any color, another ? Block, then a boss fight at the end with Petey Piranha. The player has only Water, Wood, Dark and Heart Orbs on the Orb field for this course. ★World 8-3 is a difficult version of World 8-3 from ★World 8, with Light Orbs appearing on the Orb field while Wood Orbs do not. The third battle contains three Coin Coffers of any color instead of two. A rare Gold Goomba sighting on the first battle. This page was last edited on March 22, 2019, at 16:46.